He drives the economy into the ground. Uses lies to justify War. And thinks he can get away with it. WELL SCREW YOU BUSH AND CHENEY! "If you're killed, you've lost a very important part of your life." "The private enterprise system indicates that some people have higher incomes than others." That was an anti-intellectual post, and does shame to this website. I would enjoy an honest discussion, but that tripe is not worth discussing. Oh come on that was funny. MAybe in the wrong forum but ha! It was good. Althought I like Bush i think he is a great president. MY NAME IS NOT REALLY SIMEONIE IT IS SIMON!!! How did Clinton get the economy back up on it's feet? Cause alot of the americans i talk to say that he was a sucky president. Althought I like Bush i think he is a great president. I can't think of anything I like about him. I mean it - I'm sitting here trying to think of a redeeming quality and I'm not coming up with much of anything. He accomplished that by turning a wartime economy into a peacetime economy. We called it the "peace dividend". W has done the reverse. Oh, and Clinton wasn't doing the "sucky", that was his intern. Ahh yeah america were'nt involved in any wars at that time. Razor, I have to agree with those who are critical of your political discourse here. Consider also that you risk alienating those with whom you might reason, even to the point of scoring some points with them. I happen to feel that George H. Bush as a topic belongs on this thread, for the simple reason that he has shown a disrespect for the scientific method in his career as U.S. President. In several cases he has approached science as a tool not for analyzing and understanding the cosmos, but rather as a means to score political points. "we need more study to see if global warming is caused by human activity"- this despite the overwhelming majority of scientists who have reached this conclusion long ago. This utterance may not be something he believes, but merely a payback to oil comapnies which helped fund his election campaign. "we cannot destroy any human embryos in our efforts to advance stem cell research. Existing cell lines will be adequate"-this despite the fact that the embryos are being destroyed anyway, and a microscopic sphere of cells is a potential future human being, not a human being. Existing cell lines are now considered inadequate, and the research is being done by other nations. "Energy Conservation is not an answer to our energy needs, it is a mere lifestyle choice"- or words to that effect. 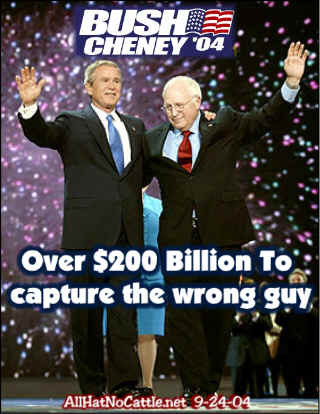 Okay, that was Vice President Cheney, but Bush let him say it. Most economists and scientists believe that improving the efficiency and reducing the waste of fuels in the U.S. would improve our economic performance by saving money that we currently send to the Middle East. Toyota Co. is now selling over 50,000 Prius hybrid vehicles in the U.S. per year, while our car companies struggle to turn a profit by selling oversized gas hogs. Still believe that "lifestyle" thing, Mr. Cheney and Mr. Bush? I will admit that other Presidents have been ignorant of science. But I cannot think of another who was so uninterested in ending the ignorance. I agree with VAlibrarian. Bush openly does violence to clear thinking science every day. He is a very poor critical thinker; he is, however, a very skilled manipulator of the emotions and opinions of other poor critical thinkers. This behavior is shameful at best. The most recent anti-scientific position adopted by the "president" is his endorsement of Intelligent Design theory. He proposes that this utterly nonsensical idea should be taught as an alternative to Darwinian theory. Two days later and I'm still trying to think of a redeeming quality. I suppose one could say that his ability to pass the "cold mirror test" is a good feature in a president, but in this case I think I might prefer the alternative. As a student of economics, Clinton started the economic downturn when his administration over estimated economic growth by 10% for two and one half years in a row. This is commonly called a LIE, and caused Greenspan to wrongly assume the economy needed slowing. Never in my lifetime have I seen a president that the press was so willing to turn a blind eye to as with Clinton. He hurt my pocketbook with his lie, and no one paid attention to the downturn that started in 1998 according to the sales figures of my company. Yes Bush is not good at science, and a lot of his backers are not good at science. But neither is the popular press, and neither are some professors that are working hard for research funding based on popular myths. That there is global warming; I will concede there is some probability. That Mankind is the cause is not so clear as the earth has been heating and cooling for many millions of years and man hasn't been here all that long by either Darwin or by Intelligent design. My anger is directed at the press that always wants a simple story that simple people can understand. My sister-in-law (now deceased) believed all this liberal hogwash to the point that she would become angry with anyone who disagreed with her worldview, but could not present reasonable arguments for any of her positions. There are always opposing views. During WWII, one third of Americans thought the war was wrong, and that FDR was a monster. History has sent that view to the trash heap of incorrect ideas. The stem cell issue is a lot larger than what it seems. How far does one go to preserve human life? If the premier of China needs a new heart, will some prisoner die on schedule so that he gets one? or is there a genetic search for some young healthy man with the right match who will willingly die for his country so that some 80 year old dictator can have a new heart/lungs/liver? These things are now possible, and open for abuse. Lonesome George to become Dad? Could fire-retardant mats be used to combat bush fires? Why does Potato bush smell more at night than during the day? whats wrong with my holly bush ? Page created in 0.198 seconds with 65 queries.